Annabella Ramos had an addiction to the theatre. She had never met another person who loved the theatre as much as she did until her older brother and caretaker, Anthony Ramos, takes her to rehearsal for an upcoming musical, 'Hamilton: An American Musical'. There she meets Daveed Diggs, a man with an obsession with theatre as well. As Annabella and Daveed freefall through heartache, devastation, and the rise and fall of the celebrity lifestyle, will they stick together, or will another man take her away? Huge thanks to @Igivegreathugs for the amazing new cover!!! And she was my hurricane. Y/N Onaodowan is the little sister of Okieriete Onaodowan and always loved to sing. She actually gets on his nerves all the time, prancing through their apartment and singing at the top of her lungs whenever she sees the opportunity to get on her brothers nerves. ...which ends up with both of them prancing through their apartment and singing songs of the musical together. "If I have to lose my sanity just to work with you then so be it!" You're a upcoming producer for your dads well known record label and the first client he hires for you is Rapper Daveed Diggs who soon becomes your Frenemy. Book 2 is out now! A distraught Daveed comes into view. His eyes are glassy and he looks worn down to a frazzle. PRODUCER: How ya feelin', Daveed? DAVEED: How am I feeling? I'm feeling a little disappointed in everyone. Your show is a joke. He begins to take off his microphone. DAVEED: No. I'm off this. Daveed and Jai met on the cast of Hamilton. Daveed has been crushing on Jai since they met, but thinks she doesn't feel the same way. Little does he know, she feels the exact same way. Daveed can't work up the courage to ask her out, and Jai is too nervous to make the first move. Until one fateful day where they are pushed together, and forced to share their feelings. You had moved from your home state to an apartment your friend owns in New York, you and your friend has gotten in to a musical known as 'Hamilton'. 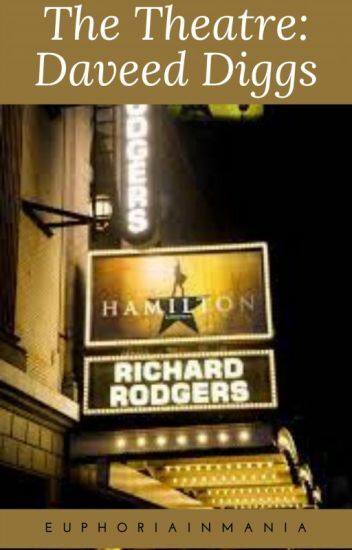 Later on, a singing contest is being held by the cast of Hamilton, and the prize is getting tickets to see Hamilton and meet the whole hamil-cast, But one of the cast members just made you feel 'Helpless'. Alexandra Jamison was a normal girl who was best friends with Anthony Ramos. When an ensemble role opens up, Alexandra auditions. There, she meets a certain someone by the name of Daveed Diggs. Jubilee Diggs is little sister to a Broadway rapper. Really little. She's fifteen, an he's twenty-five. And, truthfully, she's not really especially excited about being sent to live with him during summer vacation. But when she meets his friend, Anthony, she finds a best friend, something she's never had before. And even though he's a bit (four yrs) too old, she can still feel that spark. The question is, does he? I wrote this when I was very young, and the only reason I keep it up is because people still seem to read it. Please take my plot holes with a grain of salt, as well as my misrepresentation of some of the Hamfam. I've grown out of it now, but when I wrote this.... Not so much. Gabriella Moreno, or Bri for short, is determined to make it as an actress on Broadway to prove to those who doubted her that her dream was not impossible. Her chance to prove this comes when she is cast as a member of the ensemble for the musical Hamilton. However, when she meets her fellow cast members, she finds herself achieving another dream. A dream that is completely different than the one to make it to Broadway. That other dream? Well, you'll just have to read on to find out. Alexandria Miranda found herself left alone in the theatre one night after her older brother, Lin-Manuel, left her there, thinking she was already riding home with one of the girls. What she doesn't know is 'Jefferson' stayed at the theatre to practice more. Alex will be stuck in the theatre with Jefferson/Lafayette for the night. Would it be a connection? or would they end up hating each other? (Y/N) has just moved to New York with her best friend from California. She grew up with Daveed Diggs but they lost contact after he moved for Hamilton. She told him to come see her but he never had the chance. Will her move help bring them together again? Will they become closer in a way they never thought possible?